My grandma’s sister, Annice, made the most delicious dinner rolls. Every once in awhile, she would surprise us with a dozen or so – which we would devour in minutes. These rolls were truly perfect. Light, fluffy, super soft, slightly sweet, and melt-in-your-mouth. She spent years – decades – perfecting her recipe and technique. My grandma passed away in 2005, and Annice a few years later. Today, I enjoy spending time in the kitchen making their recipes, reading the notes they scribbled on the recipe card, imagining them making modifications along the way that truly gave their dishes “made with love” status. I hope you will enjoy this recipe as much as my family has over the years. The rising times are somewhat flexible. The original recipe is called "overnight buns", because the final rising time is intended to take place overnight. However, you can eye-ball it. Just keep checking the dough as it rises. You'll be able to tell when it doubles in size. In a glass mixing bowl, dissolve yeast in warm water. Add sugar. Wait about 5 minutes, or until foam appears. In a microwaveable bowl, melt lard. Remove, add 2 cups of water, and stir well. Add yeast mixture. Add eggs, sugar, salt, and about half of the flour. Continue adding the remaining flour, about 1/2 cup at a time, mixing well each time. You want the dough to be slightly sticky but easy to work with. Move dough to a floured surface and knead for about 5 minutes. Place dough in a bowl sprayed with non-stick cooking spray or oil. Cover with plastic wrap and place in a warm location until dough doubles in size, 1 to 3 hours depending on the yeast you choose (read package directions). Once the dough has doubled in size, punch it down. Re-cover the bowl and let it rise again in a warm place for 1 to 3 hours. Place dough on a floured surface and knead for a minute or so. Take a golf ball-sized piece of dough and make a smooth circle out of it, folding the edges underneath so the top is smooth. Place dough balls evenly spaced on a greased baking sheet. Allow a little space between each dough ball. Cover with plastic wrap and place in a warm spot for at least an hour or overnight. Preheat oven to 375F. Bake uncovered for about 15 minutes. Watch closely to avoid over-baking or burning. What a treasured recipe! Love that it calls for lard — that’s a tried and true (and old!) recipe. These look lovely; I so appreciate you sharing them! Haley, the dinner rolls look exactly like my mother’s! I can taste them now. She would be proud! Thanks for sharing the memory. I am a physician and my mother told us studying was more important than being int he kitchen. She would always say, “If you can read, you can cook!”. But, alas, she never wrote down any of her recipes. I searched online for a dinner roll recipe using lard because I remember my mother using lard in making her dinner rolls. We were too poor to have butter. 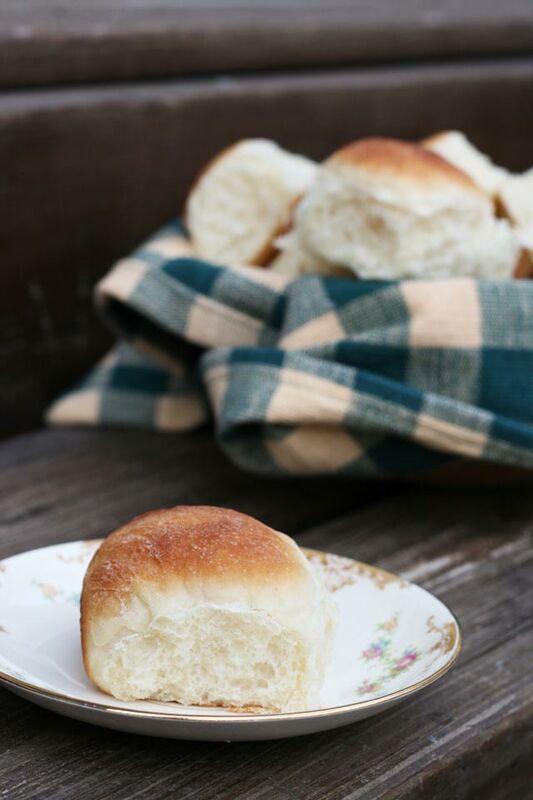 I am 70 years old now and I have longed for a dinner roll recipe like MY Mom’s. She has long passed and she never wrote down her recipe, but I remember our neighbors knocking on our kitchen door and asking my mother for one of her dinner rolls when they came out of the oven. Mmmm!! I also remember her “punching down” the dough and leaving the bowl covered overnight. I have not tried the recipe yet, but just having something in writing that reminds me of my mother is priceless. Thank you and thank Sonya.